Astronomers have made a new detection of gravitational waves, named GW170814, after the day it was detected, that occurred nearly 2 billion years ago, and for the first time have been able to trace the shape of spacetime ripples sent when black holes collide. The announcement, made at a meeting of the G7 science ministers in Turin, Italy marks the fourth discovery of cataclysmic black-hole merger, and the first to have also been picked up by the Virgo detector, located near Pisa, Italy, reveals a new layer of detail on the three dimensional pattern of warping that occurs during the violent collisions of black holes. The Virgo team has been hunting for ripples in the fabric of space-time since 2007. But it was being upgraded at the time of the historic first detection of gravitational waves by the twin laboratories of Virgo’s US cousin, the Advanced Laser Interferometer Gravitational-Wave Observatory (LIGO), and was also out of action for two subsequent sightings, according to Nature.com. Virgo rejoined the hunt this year on 1 August, following a 5-year, €23-million (US$27-million) upgrade. 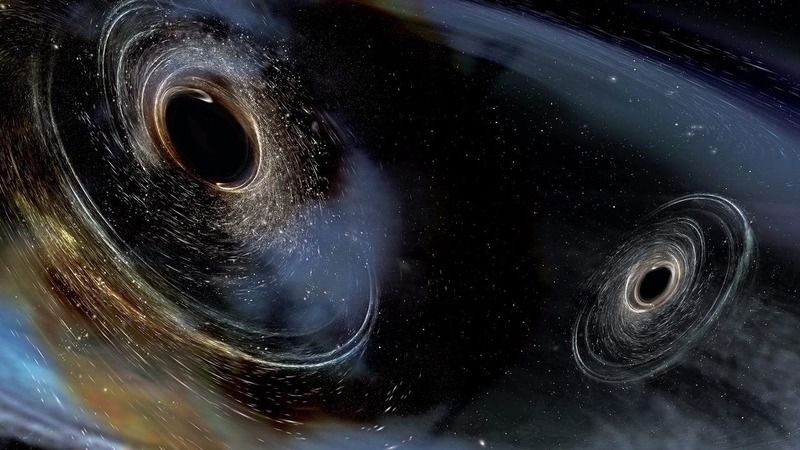 And on 14 August, both it and LIGO picked up the gravitational vibrations emanating from a pair of rotating black holes, with masses of 31 and 25 times that of the Sun, as they merged together, physicists announced on 27 September at a press conference in Turin, Italy. The collision happened around 540 million parsecs (1.8 billion light years) away in the direction of the constellation Eridanus. The wave arrived first at LIGO’s station in Livingston, Louisiana, as a ripple in space-time that subtly shifted the relative lengths of two arms of the detector as it passed. Just eight milliseconds afterward, the same wave swept past LIGO’s second detector in Hanford, Washington, before arriving at the Virgo detector six milliseconds later. "It is tantalising to see this new story of how black holes formed and evolved through history of the cosmos," Sheila Rowan of Glasgow University told BBC News. "This information is almost within our grasp but we are not quite there yet." The latest detection was the first to include the VIRGO detector and so the first for which astronomers could swing their telescopes into a more focused search zone. Giovanni Losurdo, who led the VIRGO project to completion, describing the inclusion of the Italian based-detector as a "milestone," said "The whole enterprise was based, since its start, on a visionary goal: the creation of a network capable of localising the sources in the sky and to start the era of investigation of the Universe. And finally, after decades, we are there." The new data appears to strongly favor Einstein’s predictions of how spacetime is expected to be stretched and squeezed. Combining results from three detectors has also allowed scientists to more accurately triangulate the area of sky from which the waves are emanating. In future, this could allow scientists to swing ground-based telescopes to the target locations to see whether there is any visible trace of the collision itself. Having three detectors, according to Nature.com, enables researchers to make a rough measurement of the wave’s polarization — a property that describes how the wave propagates through space in three dimensions. This meant physicists could test a prediction made by Albert Einstein’s theory of relativity, which, besides predicting gravitational waves, also implies that such waves should stretch and contract space in planes that lie at right angles to each other. The data from GW170814 seem to support this, Frédérique Marion, a physicist at the Laboratory of Particle Physics in Annecy-Le-Vieux, France and member of the Virgo Collaboration, told journalists at the press conference. “This was the first opportunity to check this fundamental property of gravitational waves,” she said. “This is just the beginning of observations with the network enabled by Virgo and LIGO working together. With the next observing run planned for late 2018, we can expect such detections weekly or even more often,” says David Shoemaker, a physicist at the Massachusetts Institute of Technology in Cambridge and spokesperson for the LIGO collaboration.